I re-read the Introduction to Sarah Young’s Jesus Calling plus a few devotionals, listened to Warren Smith’s presentation last year on You Tube about the book (July 24, 2013), and checked out Hank Haanagraf’s remarks from one of his Bible Answer Man broadcasts (November 16, 2012). I see valid criticisms. Sarah Young fails to put a clear focus on the sovereignty of God separate from us; by speaking in the first person she blurs the line. Missing is mention of a clear path to salvation (and the gifts of eternal life in addition to true peace, love, joy, patience, kindness, goodness, gentleness, faithfulness, and self control) that comes only through a personal relationship with Jesus Christ. She tends to bring God along with her instead of placing God as head of the body of Christ; this is often the sign of a carnal Christian or new believer. The book also uses metaphors and popular analogies that are not necessarily Biblical to bring the reader into the perspective of how God might view our daily lives. Her focus on these types of experiences can be problematic for many reasons including misleading a person who tends to be led by emotion instead of the immutable truth of the Word of God. And lastly, the book does nothing to point a seeker to the Bible, a healthy well-balanced Christian church, fellowship with other believers, or educate him or her on the basic tenants of Christian faith. 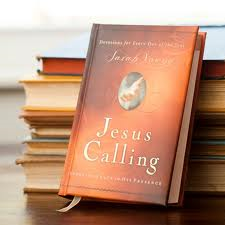 If Jesus Calling were a Bible commentary, it would fail. If Jesus Calling was intended as a tool for evangelism, it would fail. If Jesus Calling was designed to be used by apologists to defend the faith, they would lose the debate. While she quotes relevant verses with each devotional, her applications might not be universal to everyone (and Warren Smith knocks down many of them). Perhaps she could be more accurate. Perhaps she was taking a little extra literary license to illustrate the softer themes of life represented with verses that are more easily understood? I am sad that a warm and friendly book that greases the seeker’s heart with a beginning understanding of the nature of God cannot also be more direct about essentials of the Christian faith too. Perhaps a Max Lucado book would do better? He uses poetry and prose with loving imagery to reach the broken hearted as well. Maybe at some level both authors are similar? You could say that their feel-good books distract a person from delving into the Bible yet they could also give another person a place to go when the Bible is just too intimidating. A scholarly book (i.e. the Bible or a commentary) and a scathing review by a New Age fear-monger such as Warren Smith, will not comfort the heart of a person in crisis! Sarah Young’s book could use some other improvements. I don’t know why her testimony in the beginning does not include a salvation story per se. Does this mean that she is not saved? We just don’t know. Again it is often literary license that an author uses more general terms of faith so as not to scare off wounded seekers that really need Him! Jesus Calling may still be useful as an introduction to a more personal God for a lost soul who may have been hurt by religion or a skewed view of who He really is. Seeing how God really does understand, cares about the details of one’s daily life, and is ever near is clear on these pages. Reading this could help old wounds to heal. Women often need this most. Their minds will still need truth so the seeker should not end his or her search with Jesus Calling, however. The book should have ended with an invitation to a closer relationship with God through His son, Jesus Christ and encourage the reader in his or her next steps as noted in my first paragraph. It does not. Is it New Agey? The fact that Sarah does not go deeper into essential matters of Christian doctrine could make it look like just another feel good book about a generic God. One might begin to pick apart themes in the devotionals and say that the God in Jesus Calling is not the God of the Bible. And if the God in the book is not the God of the Bible then it must be about Satan or some New Age alternative that is neither one. So the next step could be to claim that Jesus Calling is a New Age book because of this and because of its use of terms reflective of popular culture, the New Age movement. Yes all of this could be true and indirectly move a seeker away from the One true God that he or she had hoped to find in an empty book. Or maybe not. I have more faith in the Lord’s plan for those who earnestly seek after Him. He calls His own. Her or she will find Him in a babbling brook if that is His will! Many would criticize my own bridge to faith in Christ that was built through the 12 steps of Al Anon Adult Children of Alcoholics. The daily devotional, One Day at a Time, is quite vanilla. The God of the 12 Steps is generic albeit consistent with the basic tenants of a Christian faith from the Bible. Tis sad that many stop at “recovery” and faith in a Higher Power in these meetings and never find the God of the Bible. But the Lord had a plan for me from that feel-good experience and used those 9 years for His glory. I would have never approached the throne of grace had I not healed from so much while sitting around the tables, held in the basement of many churches and not in the sanctuary. I make two references to Jesus Calling in my eBook, Hope Beyond Lyme: The First Year. In the first I quote a nice encouragement Sarah Young gives about: 1) many of us seeing only a part or the “tip of the iceberg” when faced with confusing situations and 2) our needing to trust God for that which we cannot see or comprehend: mysteries. The second time I quote the book I name both Mrs. Young’s devotional along with a secular book of comedy as books with some wisdom but that both are second to the Bible. I wonder if my friend misunderstood me: Jesus Calling is not my second favorite book! I read Jesus Calling over these past 2 years when I was in crisis every day and struggled to hold a heavy Bible let alone concentrate on it. Because it comforted me I included it when writing the eBook. I read my Bible most days anyways, of course! The centrality of the Bible for me and for the eBook should be clear by the over twenty passages of scripture quoted and referenced. No book is a replacement for the truth, hope, and eternal significance of the Holy Bible. Today I am grateful to have a Bible App on my smart phone that I can easily hold in the palm of my hand in bed during trying times. The Lord has opened my mind to more of His Word and the ability to concentrate on it too. I am grateful for a temporary tool, a small devotional book, that the Lord used to comfort my heart until I could read His Word again. I pray for spiritual armor to protect me and wisdom to discern any unsound doctrine that would harm my relationship to my King, my Savior, Jesus Christ. I also pray that the millions of readers of Jesus Calling would continue to seek the Lord and find Him in the person of Jesus Christ alone. Thank you Lord for my friend’s willingness to dialogue on this important topic. May it all be for Your glory, in Jesus’ name. Amen.